The earliest point that Christopher Ridout is known to have had some interest in the Primsley tithing of Sherborne was in 1709, when he was forty years old. Christopher was an assignee of Thomas Hobbs, a gentleman, who held the lease of Primsley Farm from the Lord of the Manor, William Lord Digby, Baron of ‘Goatshill’ (actually Geashill, in Ireland). This lease was for a term of lives where the ‘lives’ were Thomas Hobbs, Anne his wife and Mary Napper (daughter of Samuel Napper). The property in question was two acres of land, part of the Primsley Farm estate, comprising a house, garden, orchard and backside (yard at the rear of the house) which were on a street called Westbury. Also about eleven acres of meadow land called Raw Meade. 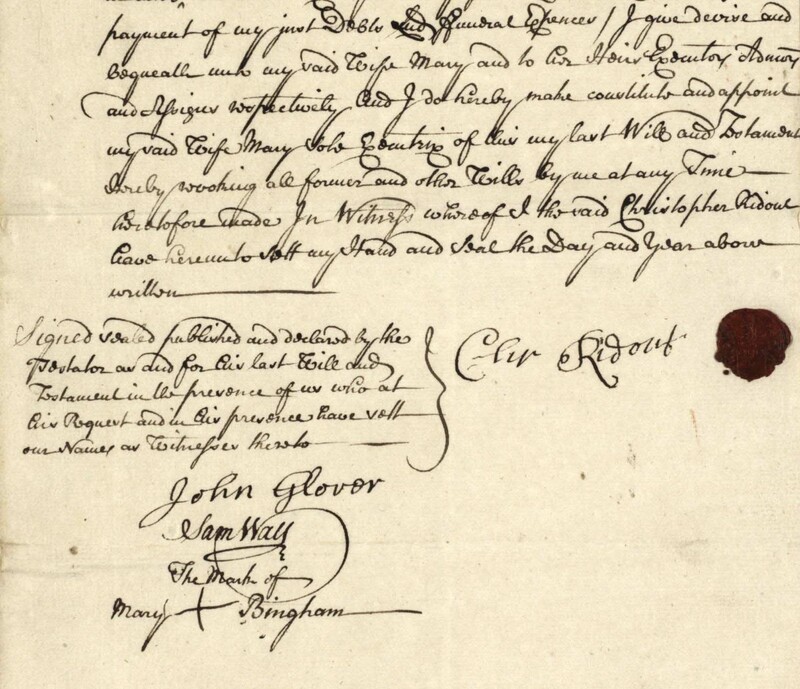 By 1720, Thomas Hobbs had died and the property reverted back to Lord Digby who, on 26th July, leased it out to Christopher Ridout, miller and Thomas Loaden, baker both of Sherborne, for a payment of £62-6s-0d. The lives were amended to include Elizabeth, Christopher’s daughter. In 1735, Christopher still held this lease, together with Thomas Ridout. The ‘lives’ were Mary Fox (nee Napper, now a widow), Rebecca Loaden and Elizabeth Ridout. Presumably Anne Hobbs had also died. Interestingly, a separate moiety of Primsley Farm had been re-named Limekiln. Limekiln Farm exists today and is not far away from Hyle Farm. This Will was proved at Sarum on the fourth day of July 1743 before the Reverend John Talman Clerk M.A. Lawful Surrogate of the Official of the Dean of Sarum. In the 1748 Sherborne Manor estates survey, the moiety of Primsley Farm was entered under Christopher’s assigns and hence his widow Mary and son George remained lives on the tenancy and may also have occupied the property. George also had a tenancy of Little Raw Mead, five acres of meadowland nearby for which he was granted the lease ten years later by Lord Digby. The various Sherborne Manor surveys, contracts and accounts make it clear that whilst William Ridout had a tenancy of Hyle, first Christopher and then his son George had tenancies in the neighbouring tithing of Primsley Manor. 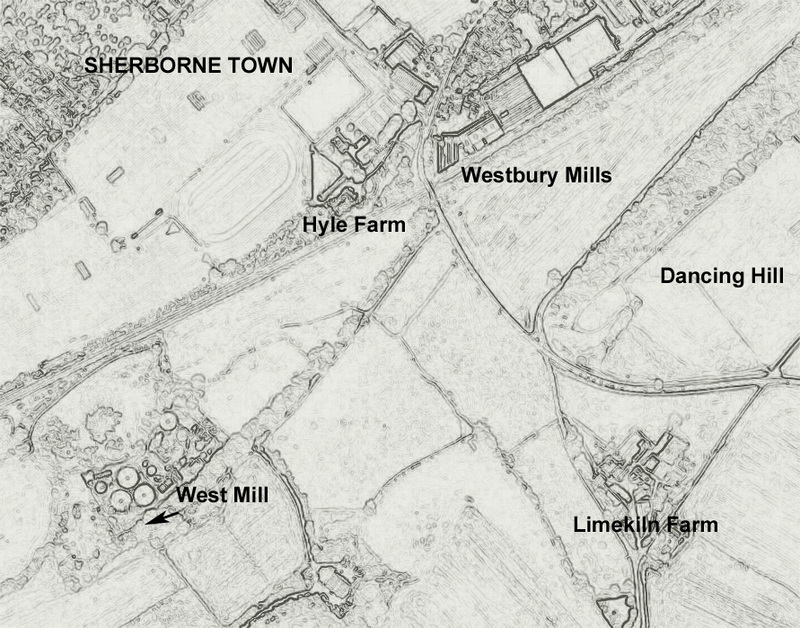 Modern maps still show Hyle Farm and Limekiln Farm but where was the mill in which Christopher then George worked? Here at last, I think, is the answer…. According to documents held by the Dorset Record Office, a silk-throwing business was established in 1753 by John Sharrer, a London silk-thrower, who leased Westbury Mill and built a new mill-house. Westbury Mill was clearly shown in the revised 1901 OS map of the area but has long since been used for other purposes and these days is referred to as the Old Yarn Mill. Its location is just across the road from Hyle Farm. The point at which the Ridout family took possession of the mill is still a work in progress. The most interesting thing is that West Mill is still there, although sadly dilapidated. 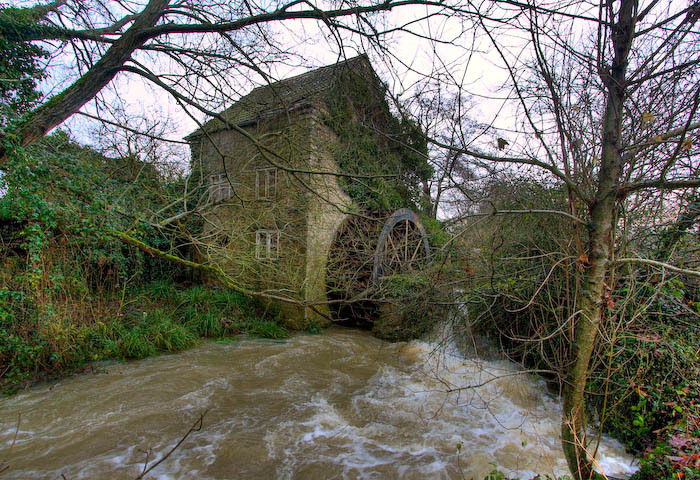 There are hopes that it can be restored and once again churn the waters of the Yeo and perhaps drive the grinding gear that once made the corn flour that made the bread that George sold. His business made him wealthy enough to send his sons and daughters into the world where some made their names such that houses and streets and towns in the American sub-continent were named after them. To you distant relations…. this is your true heritage – a little watermill in Sherborne! See more photos here and see heritage status here. An interesting postscript to this story, at least to me, is finding that one of John Sharrer’s nephews, who went into the business in Westbury Mills (being a silk throwster) was George Ward, a man who subsequently married George Ridout’s daughter Elizabeth on the 15th February 1768 in Sherborne. Obviously a subject which needs further investigation – my family were always of the opinion that we were concerned with silk production at some point in our past. Today I believe them. This entry was posted in General and tagged Christopher RIDOUT, George RIDOUT, George WARD of Bruton, Hyle, John SHARRER, Limekiln Farm, Manorial records, Primsley, Primsley Farm, RIDOUT, Sherborne, West Mill Sherborne, Westbury silk mills, William RIDOWTE. Bookmark the permalink. My family are the Giffords who — if the infomration in our family papers is true — owned 600 acres of land in Dorsetshire and the farm was called “Sherborne”. Hi Graham … the name Gifford rings a bell but I’ll have a poke round and get back to you! Me again – I’ve cast about here and there amongst my records but haven’t found anything I’m afraid, sorry. Have a look on the Dorset OPC website – there are numerous mentions of Giffords but most seem to be in the 19th century and I didn’t see any mentions of a farm. Not very helpful but good luck – I hope you find something.